In your WordPress admin panel, navigate to Plugins > Add New > Upload. 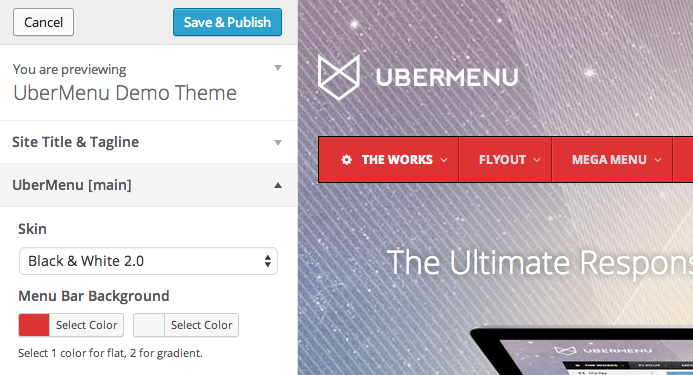 Choose the UberMenu plugin zip and follow the prompts to install and activate UberMenu. At this point, UberMenu will have no effect on the front end of your site. If you don’t have an menu yet, go to Appearance > Menus and create one. If your theme properly supports theme locations, click the Manage Locations and assign your menu to the appropriate theme location. To add the menu to your site, you can use either Manual Integration or Automatic Integration (if your theme supports it). 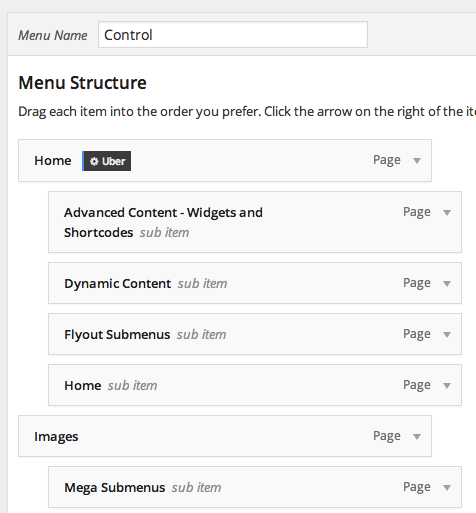 To integrate UberMenu automatically, go to the UberMenu Control Panel (Appearance > UberMenu). Under the Main UberMenu Configuration > Integration > Automatic Integration Theme Location, check the box next to the Theme Location you wish to activate as an UberMenu. The name of the menu assigned to the theme location is in the box to the right of the theme location. Click Save Main UberMenu Configuration to save your changes and activate UberMenu on your theme location. 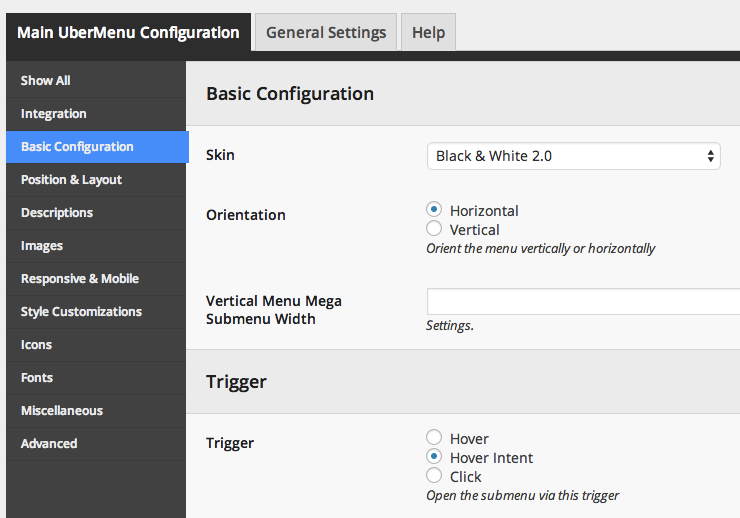 To integrate UberMenu manually, go to the UberMenu Control Panel (Appearance > UberMenu). Under the Main UberMenu Configuration > Integration > Manual Integration > Manual Integration Code, select your chosen menu under “Integrate Specific Menu”, then copy the code. 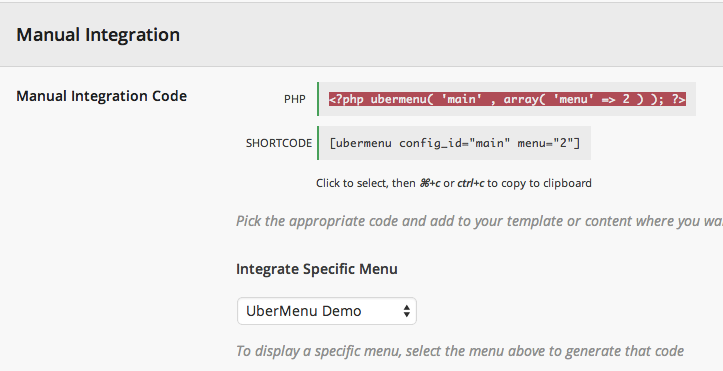 Paste the code into the appropriate theme template (usually header.php) to insert UberMenu. You may also wish to remove your theme’s menu code. It is best to create a Child Theme and make the changes there. To configure settings for individual menu items or submenus, visit Appearance > Menus, hover over the menu item you want to configure, and click the Uber button that appears. The Menu Item Settings Panel will slide up. Click the tabs on the left to access the various panels of settings. Click the blue Save Menu Item button at the top to save settings for this specific item. To configure a Submenu, click on the parent item for that submenu and then click the Submenu tab on the left. Want to customize the colors, fonts, and more in your menu? Visit the theme Customizer (Appearance > Customize) to customize the menu with a live preview.